Yogi Tea was founded in 1984 and is based in Springfield, OR. 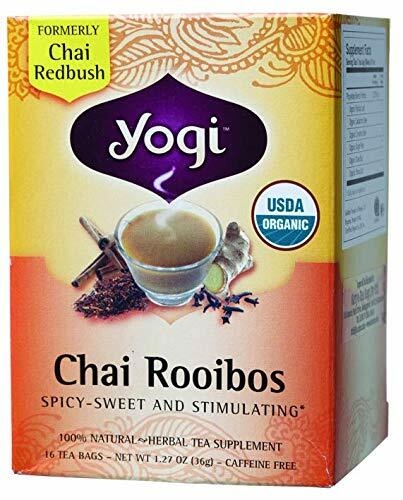 The original Yogi tea included traditional Ayurvedic spices: black pepper, ginger root, cardamom seed, cinnamon bark and clove bud, which exuded a vibrant taste and aroma that enlivened those who drank it. These students started developing their own Yogi tea, with packages of dried spices appearing in natural food stores throughout Southern California and then Europe. This tea company’s products and ventures are guided by these principles, as they believe that the purpose of their business is to serve. Offering specialized herbal formulas with over 60 tea blends, Yogi Teas are now available throughout the U.S., Canada, Japan and Europe. Dedicated to sourcing premium quality botanicals from around the world, Yogi Tea’s philosophy is rooted in Ayurveda and devoted to wellbeing. Understanding that charity begins in the home has led to this tea company’s commitment to creating and maintaining a positive workplace for their trusted employees. With over 40 years of experience, Yogi Tea focuses on making their teas naturally organic and accessible to all, including more than 140 exotic spices and ingredients from all over the globe. Inspired by healthy living, this tea company follows the teachings of Ayurveda, Traditional Chinese Medicine and Western herbalism. Preferring to work with rather than against nature, Yogi Tea strives to provide great tasting tea which is also good for you, crafted in kitchens, not laboratories. Another feature of Yogi teas is that they are not supplemented with vitamins and minerals, relying on the naturally healthful qualities of the ingredients themselves. All processes involved in creating Yogi Tea blends include site visits to the sources, quality testing and packaging, taking care to observe their own scrutinizing standards that adhere to sustainability principles. A Certified B Corporation, this tea company uses the power of their business to solve social and environmental problems. Always taking into consideration the impact of their decisions on their employees, suppliers, consumers and the environment, Yogi Tea is dedicated to meeting even higher standards than those implemented by traditional corporations. This includes a focus on transparency and accountability. This tea company is in partnership with the Rainforest Alliance, to ensure that their processes help towards preserving wildlife and the environment, as well as ensuring sustainable livelihoods and biodiversity. Yogi Tea’s ingredients are handled carefully to ensure quality and consistency, from harvest to shipping. Along with requiring their vendors to regularly perform Good Agricultural Practice (GAP) and/or Food Safety audits, Yogi Tea can rest assured that their products are handled and produced safely to minimize risks of food safety hazards. Every ingredient that goes into every cup of Yogi Tea is assessed for quality, sustainability and social responsibility on a local, national and global level. Over 140 ingredients are sourced from around 50 countries, but this tea company also supports local businesses and have donated over 2,300,000 servings of tea to local food banks. Other programs Yogi Tea is involved in include non-profit organizations like the Pearl Buck Center, who provide vocational training to adults with developmental disabilities. International partnerships include Bridging Communities in Honduras, where the everyday lives of local cardamom suppliers are improved and the Kumari Project, which was founded by the daughter of a former Yogi employee, to build safe and joyful childhoods for orphans in Nepal, and many more. Every year, Yogi Tea contributes more than $500,000 to non-profit organizations, who offer training in relaxation techniques in over 100 countries around the world. The great thing about Yogi Tea’s website is that you can explore their products by function or flavor. All all Yogi Teas are Certified Kosher, USDA organic, Vegan, Non-GMO product verified and use natural, compostable teabags and packaging. 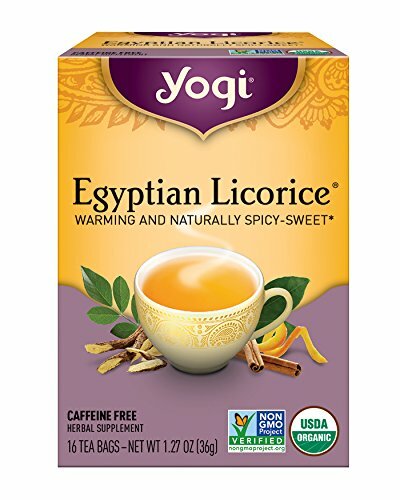 The great Kings of Egypt treasured licorice root, for its sweetness, soothing properties and rich flavor. This tea blend includes cinnamon and orange peel to impart a zesty, warming, delectable flavor and aroma. Naturally organic and satisfyingly warm, Yogi Chai Black tea is made with Assam black tea, cinnamon, cardamom and ginger, to provide an exotic and alluring blend. Drink it with or without milk and savor the exquisite goodness in every cup. Supports digestive health and energy so you can feel your best. 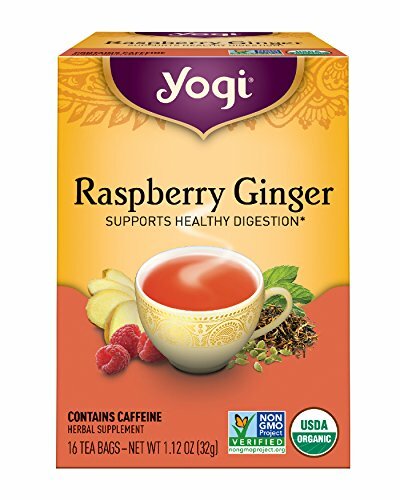 If you’re up for a fruity blend, then this Raspberry Ginger tea will prove to be an invigorating cup. Using ginger, hibiscus and raspberry to add even more depth to their Pu-erh and Assam black tea leaves, Yogi Tea has crafted yet another all-organic blend, with the addition of piquant anise and refreshing spearmint. Prepare to be intrigued by the sweet yet tart notes when enjoying this delicious tea. Yogi Tea doesn’t promise the world, but they are proud and at the same time humbled by their experiences in creating genuine products, which go hand in hand with helping local and global communities. Whether you’re drinking their teas for health or pleasure, you can be sure that taste and quality are only the tip of the iceberg with Yogi Tea.